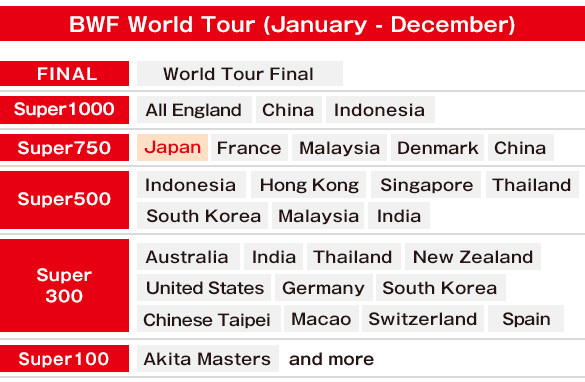 The 37th Japan Open is an official international tournament certified by the Badminton World Federation (BWF). Starting from this year, the tournament level has been raised to BWF World Tour “Super 750” with the amount of prize money increased substantially to 700,000 US Dollars. This makes it one of the world’s premier badminton tournaments featuring only players within the top 32 in the world. The venue has moved to the Musashino Forest Sport Plaza, which is going to be used for the 2020 Tokyo Olympics. This means the tournament will attract attention from players from across the world who are aiming to play at the Olympics. 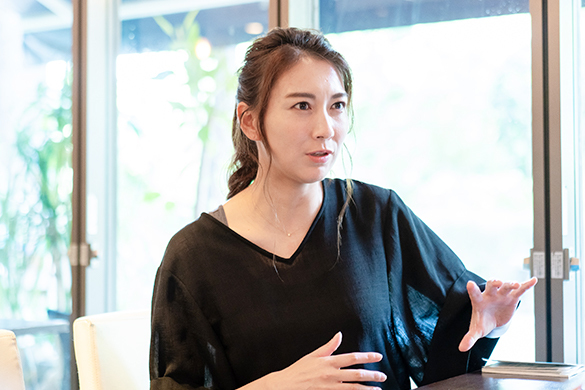 We asked Kumiko OGURA, who has played at the Japan Open as well as the Olympics, about the attractions of the Japan Open, the players who are expected to succeed at this year’s tournament and the Japanese players who are leading the Japanese badminton scene as they aim for 2020. Here are the talking points for the newly scaled up Japan Open! 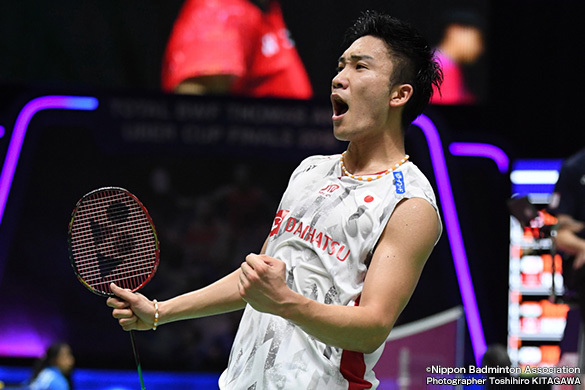 From this year there are major changes to the rankings of international badminton tournaments; the Japan Open will be at the level known as BWF World Tour “Super 750”, making it one of the world’s top international tournaments. Only players ranked within the world top 32 will be eligible from this year, so it has become a tournament that will be difficult to reach even for players from the host nation of Japan. On the other hand, the top ranked players have an obligation to appear, which means that the top level players in the world will definitely be there. This is sure to make it an entertaining tournament played at an extremely high level. The venue from this year will be Musashino Forest Sport Plaza. This location will be the venue for the 2020 Tokyo Olympics, so players from across the world will no doubt be looking to gain match experience there. Japanese players have not played often there neither, so they will be wanting to get a feel for the venue’s atmosphere at this tournament. I actually had a chance to play at the main arena of the Musashino Forest Sport Plaza at a recent event. It is easy to see the shuttle, thanks to the dark walls, so it was easy to hit it. The ceiling of the venue is also quite high, so there are a lot of seats to make it easy for the fans to see the matches. Here are the players that OGURA will be looking out for at this year’s Japan Open! The number one player to focus on at this tournament has to be Kento MOMOTA in the Men’s Singles. He has already achieved good results at various tournaments this year. After his absence, I feel that he has matured to another level. He has always had good intuition and ability, but I think his receiving in particular has really improved. He is able to receive in a way that is not defensive but instead leads to attack, while his footwork is assured and he has a strong core. In addition to his natural ability, I think his recent performance has boosted to his confidence. He has the intelligence to turn experience into power, so he will surely achieve good results at this year’s Japan Open. The Japanese fans will want to see him win at this major tournament at home, so I really hope MOMOTA can bring out his best. For the Women’s Singles, the duo of Akane YAMAGUCHI and Nozomi OKUHARA cannot be ignored. When she is on a roll, YAMAGUCHI plays so incredible that she is unstoppable, while she also has fine instincts and tricky shots that other players don’t possess. She is a very strong player if she gains control from the start of a match. YAMAGUCHI has also said herself that the Japan Open is a tournament that suits her well, so I think she will enter it with a lot of motivation. As for OKUHARA, she won the recent Thailand Open 2018 and her vision from the game is not bad, so I think she will approach this tournament in an improved condition. She had a direct contest with YAMAGUCHI at the Rio Olympics, so we might be able to see a rematch from these two at the Japan Open. I am really looking forward to it. For the Men’s Doubles, Keigo SONODA and Takeshi KAMURA’s “Sono-Kamu” is the pair to look out for. KAMURA has been playing really well in the forward position in the past couple of tournaments and he is getting better at setting the pace of the game. Also, while KAMURA used to be the one who led the pair, SONODA has become more aggressive this year. The pair is naturally good at low flying shots, so if they gain control of their matches, they have a strong chance of winning the tournament. 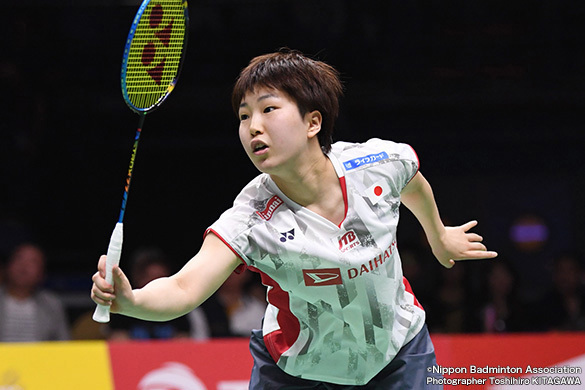 For the Women’s Doubles, the “Taka-Matsu” pair of Ayaka TAKAHASHI and Misaki MATSUTOMO, as well as the “Fuku-Hiro” pair of Yuki FUKUSHIMA and Sayaka HIROTA both have plenty of experience at international tournaments and understand what is needed to win. Both pairs have so much fighting spirit, so if they play each other there will be a lot of pride at stake. It should make for an entertaining contest. I also have to mention the pair of Wakana NAGAHARA and Mayu MATSUMOTO who brilliantly won the gold medal at the world championships. The pair has always played aggressively, and their receiving style is also aggressive. They are the pair with the most momentum right now, so I recommend everyone to come to experience their absolute attacking play that had conquered the world. For the mixed doubles, the pair of Yuta WATANABE and Arisa HIGASHINO are worth taking notice of. They had the remarkable achievement of being the first Japanese to win at the All England Open, so needless to say that they thrive on the big stage. For the mixed doubles it is said that the female player has to take initiative to win. HIGASHINO in the front position can do a powerful jumping smash and is a wild player whose proactive play can strike fear in the opponent. WATANABE’s style is based more on technique than power, so if the spirit of HIGASHINO combines well with the technique of WATANABE, they can surely aim to win this tournament as well. It isn’t just MOMOTA, YAMAGUCHI and OKUHARA, watch out for these players too! 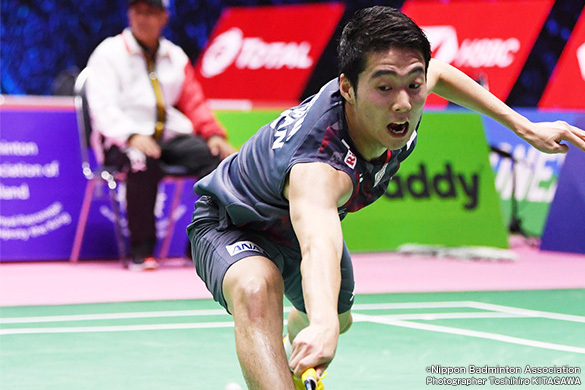 There are some players who are worthy of note not only for their anticipated success in this year’s tournament, but also for leading the next generation of the Japanese badminton scene as they aim for 2020. I will be paying attention to Kanta TSUNEYAMA in the Men’s Singles. He is only 22 years old but has developed significantly lately and won the recent “Thailand Open 2018”. He is good at placement, and his shots are hard to read for the opponents. He is a tough sort of player with a strong mentality. He is lightly built at this point, so he relies on skillful control rather than power. He is still young he has room to grow. I am looking forward to see how he will develop. Sayaka TAKAHASHI is a player to look out for in the Women’s Singles. She is a B representative for now but she won the Singapore Open 2018 and has a lot of natural ability. She has the angles, shots and height to be able to hold her own overseas, so she may be able to trouble YAMAGUCHI and OKUHARA at this tournament. In the Men’s Doubles, the pair of Takuto INOUE and Yuki KANEKO as well as the pair of Hiroyuki ENDO and Yuta WATANABE are the heirs to the “Sono-Kamu” pair. With the pair of INOUE and KANEKO in particular, they both play in an unpredictable way so I think they will play entertaining matches at this tournament. For the Women’s Doubles, I hope people pay attention to Ayako SAKURAMOTO and Yukiko TAKAHATA. They have not appeared in many matches so their rank is still low, but they are the most promising pair right now. Especially in recent times, the look in their eyes and expressions during the matches are improving. It seems there is an atmosphere now that they feel comfortable as representative players. Rather than just catching up to the A representatives, it feels like they are ambitious and really want to take it to their opponents when they get the chance. Once they build up experience and develop stability, I think this pair will be more than capable at a global level. Powerhouse foreign players to look out for! Of course, the Japan Open is an international tournament, so it isn’t just Japanese players who will feature but also top players from around the world. This will be the first tournament to be held at the venue of the Tokyo Olympics, so this has made it particularly appealing for players who have their sights set on 2020. Many of them are likely to appear here. All the players are ranked within the world’s top 32, so everyone is at a high level, but from Malaysia I will be focusing on the Men’s Doubles pair of GOH V Shem and TAN Wee Kiong. They were silver medalists at the Rio Olympics, but recently their ranking has fallen slightly. However, they have a strong natural ability and are unstoppable once they build momentum, so they are fearsome rivals for the “Sono-Kamu” pair. For the Men’s Doubles, the Indonesian pair of Marcus Fernaldi GIDEON and Kevin Sanjaya SUKAMULJO who won the tournament last year are also worth paying attention to. They are both quite short in height, but they are able technicians and play their matches at a fast tempo. Kevin in particular plays in an entertaining way, so he is a player that people should come and see live at the venue. For the Women’s Doubles, the pair of Greysia POLII and Apriyani RAHAYU who are from Indonesia should be favorites to twin the tournament. They are a pair with quite an attacking style, who make use of low flying shots and fast play that Indonesian players are so good at. The Japanese Women’s Doubles players such as the “Taka-Matsu” pair are sure to be aware of this duo. I’m looking forward to seeing you at the tournament venue! With the increased level of the participating players due to the upgrading of the tournament and because it will be the first international tournament held at the Tokyo 2020 Olympics venue of Musashino Forest Sport Plaza, the world is going to pay attention for this year’s Japan Open. This is the only tournament in Japan where you can see matches of such a high quality, so I hope the fans will come to the venue to watch the world class contests live. What I would especially like you to experience is the incredible speed and the sound of the shuttle. At the venue, you can enjoy the three-dimensional sense of presence that cannot be felt by watching it on a TV screen. On the day there will also be the winners of the 19th Daihatsu ABC Badminton National Primary School Tournament coming to the venue to hold an exhibition with the representative players, so please look forward to that as well. We need to pay attention to the primary school players too, because future Japanese national players could be among them! I’m going to the venue as well of course, so let’s all cheer for the Japanese players together! 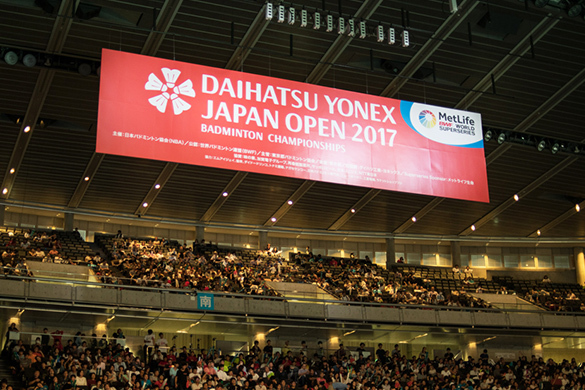 "DAIHATSU YONEX JAPAN OPEN 2018 BADMINTON CHAMPIONSHIPS Overview"
Born in year 1983 in Mie prefecture. She starts playing Badminton at the age of 8. In year 2000, she achieves 1st runner up for the High School Nationals and in year 2001, achieves 1st runner up for the National High School Selections. After joining Sanyo Electric in year 2002, she emerges as champion for the All Japan Badminton Championship Singles. 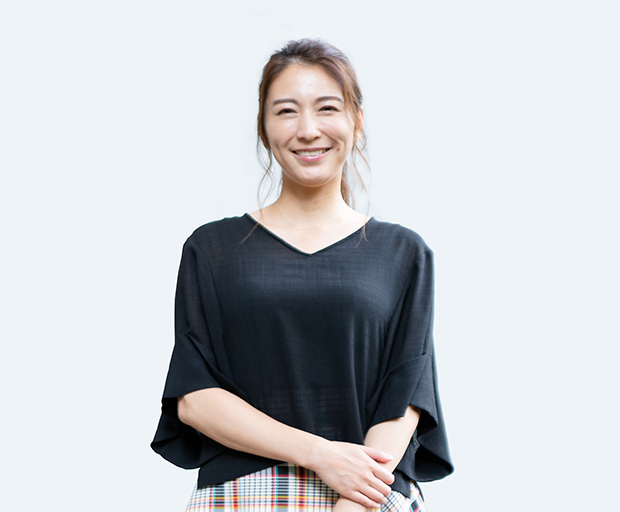 She switches to be a Doubles player subsequently, and achieves 5th place for the Beijing Olympics and 5 consecutive champion for the All Japan Badminton Championship. She retires in January 2010.